It’s all about the birthdays… May 12th is the birthday of both Tim Callender and Bruce Boxleitner! It’s also Migratory Bird Day, which amuses Jeffrey to no end. And what did you do for Mesmerism Day? Discussion: Gary wishes Tim a Happy Birthday; Neil calls from Goddard Space Flight Center about the Shuttle Launch; Gary posits that we may have eventually seen some leadership juggling had Crusade gone on longer. Tim reads emails from Bob, who tells us that he’s doing a full B5 episodic immersion, by watching the episode, reading the scriptbook and Babylon File and Lurkers Guide entry… he also wants to hear more varied opinions on the show, so he’s in for some fun when he gets to S5; Jim wonders about the portrayal of the military, and how they seem more like businessmen rather than officers in the military. I celebrated Mersmerism day by suggesting to my kids that they shoulddo their chores. And if your kids are like mine, they have amazing resistance to such mental controls. 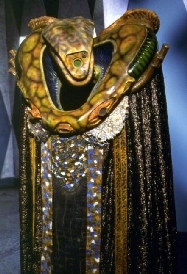 Wasn’t Russ Johnson the second Vorlon? He didn’t do the pilot. They are all the Vorlon. Very entertaining show. When Vorlons collide ….